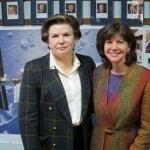 Dinner with a Slice of History Marcy Frumker- Women in the US and Soviet Space Programs. At The International Women’s Air & Space Museum Burke Lakefront Airport April 5, 2013 Dinner will be served at 6:30 with the program starting at 7pm. Marcy Frumker, space advisor and trustee to IWASM, will discuss women in space from the earliest days to the present. 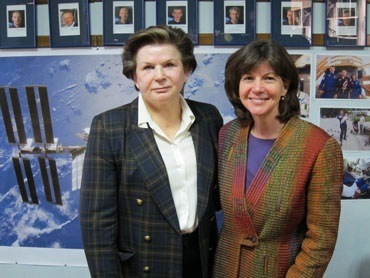 Hear about the first woman in space, Valentina Tereshkova, as we celebrate her launch 50 years ago. Learn also about the first American woman in space, Sally Ride, who launched into space 20 years later, and the many women astronauts who followed her into space. Learn how astronauts eat, sleep and adapt to living in space--some for six months at a time! **Come see a real "out of this world" moon rock that will be on display from our colleagues at NASA Glenn. It was brought back from the moon by the Apollo 15 astronauts. Tickets are $15, $12 for IWASM Members- Member discount will be given after registration.